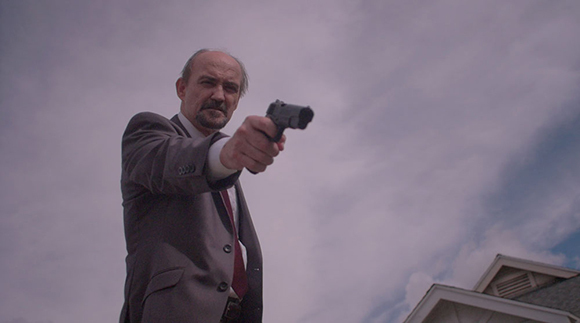 Hit the Hitman is in Post Production! Just a little update on our short film. I’ve been really busy so I haven’t had a lot of time to post, so a lot has happened! We wrapped principal photography two weekends ago and I couldn’t be happier with how things came out. I learned quickly that no matter how much you plan (an believe me, I planned thoroughly) once you’re on set, there are factors that you have to deal with that can derail those plans quickly. Luckily I had a great team of folks that helped me to still get what I wanted and a group of actors that knew their stuff and were still able to roll with what I was throwing at them on set. The whole thing has been a family affair. That handsome devil above happens to be my dad. It was a lot of fun to have friends that I’ve known since middle school and high school help out and to have my brother and my father in two of the biggest roles. As I look at the footage I can’t help but crack up. It’s all looking really cool and I can’t wait to share it. Those that backed the Kickstarter will see it first and that’s looking to be at the start of the new year. Check back here or on our Facebook page. I hope to have more updates soon.